The Sir Zelman Cowen School of Music at Monash University and the School of Music at the University of Leeds facilitate leading transnational collaboration in music research. The Monash–Leeds Music Research Collaboration is founded upon critical synergies in research strengths between the two schools, and allows staff at both institutions to pioneer new collaborative research projects with scholars around the world. Staff in the Leeds ‘Music as Culture’ cluster research topics as diverse as Jewish music, Lady Gaga, German operetta and British music and criticism. Bawdy Songbooks of the Romantic Period, 4 vols. Edited by Patrick Spedding and Paul Watt. London: Pickering & Chatto, 2011. Volume 4 is edited by Derek B. Scott at Leeds. 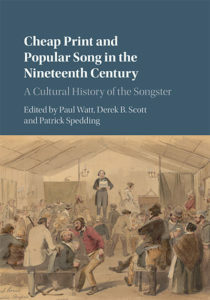 Cheap Print and Popular Song in the Nineteenth Century: A Cultural History of the Songster. Edited by Paul Watt, Derek B. Scott and Patrick Spedding. New York: Cambridge University Press, 2017. July 2014 : Paul Watt, Sarah Collins and Michael Allis convened a conference ‘Music Literature, Historiography and Aesthetics’ at the Institute of Musical Research, University of London. April 2014 : Dr Michael Allis presented a keynote talk ‘The Diva and the Beast: Susan Strong and the Wagnerism of Aleister Crowley’ at a conference entitled ‘Words about Music’, Monash Law Chambers. December 2012 : Professor Derek B. Scott was Distinguished Visiting Scholar in the Sir Zelman Cowen School of Music at Monash. September 2013 : Royal Musical Association Conference: Derek B. Scott chaired a panel on ‘Popular Music and the First World War’ with Paul Watt, Rachel Cowgill and Zoë Lang.